A missing private investigator is discovered in a locked car, deep in the woods—however, the area had already been searched by police. As suspicions about the handling of the case fester and calls for the truth grow louder, the only man who knows where the trail may lead, and how dark its destination, John Rebus, is called to investigate. 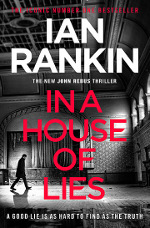 We are delighted to be welcoming Ian Rankin, one of Scotland’s most adored writers, to St Andrews with the latest Rebus novel, In a House of Lies.